Victory with wreath between Hellas and Britannia, athlete seated on r., winner`s medal below, athletes on sides. 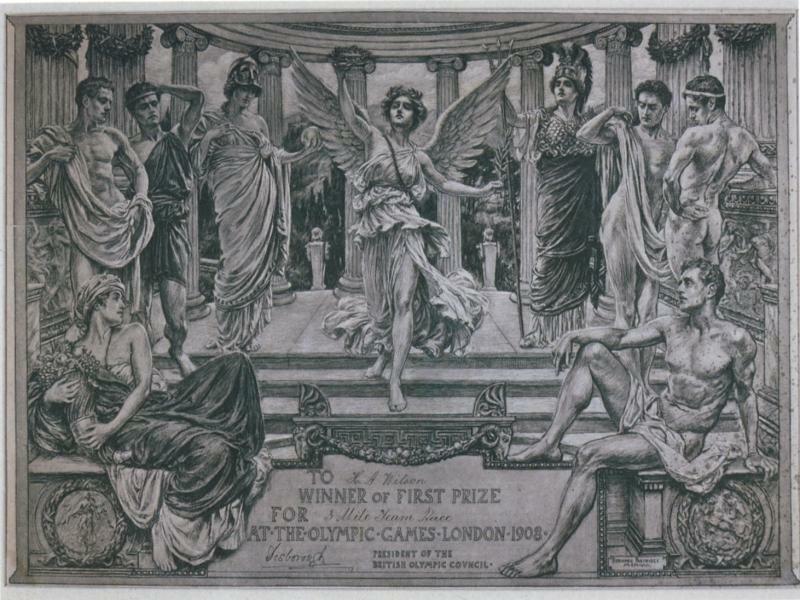 The first design, for prize-winners only, representing a winged Victory between the figures of Hellas and Britannia, was exhibited in the Royal Adademy, and was awarded in its larger form to winners of gold medals, and in a slightly smaller form to winners of silver and bronze medals. Each winner of a gold medal also received the smaller form of this diploma for presentation to his Club or Association as a memorial of his success. The second design, representing Victory seated, was worked out in black and red, and formed a Diploma of Merit, which was awarded by the various Associations controlling each series of events in the Games to athletes who achieved a high standard of excellence without getting first, second, or third in their competition. 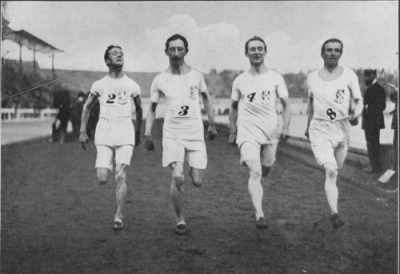 In a certain number of restricted cases this diploma was also awardet to officials and other for services rendered to the British Olympic Council in the organisation of the Games. It was thought right not to confuse the design in either class of medal by too long an inscription, so the event for which each prize-medal was awarded was incised upon the edge of its rim, with sufficient space left for the addition of the winner`s name. The same inscription was placed on the box containing each medal. The 250 gold medals ordered by the Concil were placed in red boxes, 260 silver in dark blue boxes, and 260 bronze in yellow boxes. The large diplomas accompanying gold medals were rolled up in tubes, 20 1/2 inches long, of red, and the club diplomas were placed in deep crimson tubes, 18 1/2 inches in length. Dark blue and yellow tubes (also 18 1/2 inches long) were provided für second and third prize diplomas respectively. The diplomas of merit (of which 500 were ordered) were placed in light blue tubes, 17 inches long. The Commemorative Medals, being larger than the prize medals, were easily distinguishable, apart from the use of various coloured boxes for each class of these awards.